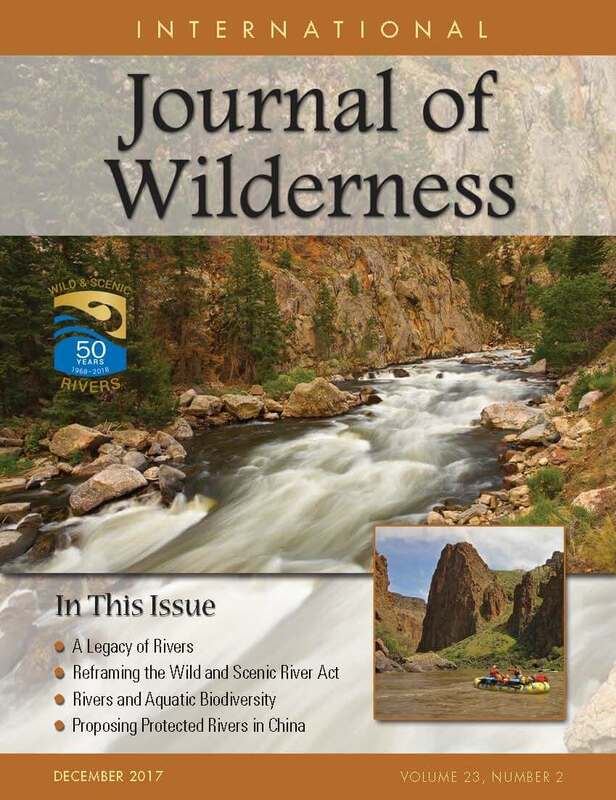 This special issue of the International Journal of Wilderness focuses on the Wild and Scenic Rivers Act to coincide with the 2018 50th anniversary year. Our editors sought to rejuvenate efforts that began 17 years ago when IJW devoted two consecutive issues to wild rivers. Wild and Scenic Rivers: An American Legacy is a welcome celebration of the 50th anniversary of the Wild and Scenic Rivers Act passed in 1968. Along with rapid economic development in China have come many environmental threats. The Chinese government adopted an “ecological civilization” national strategy to change the land development patterns, promote resource conservation and utilization, protect natural ecosystems and the environment, and improve quality of life in China. Formerly diverse and abundant freshwater species are highly imperiled, with higher extinction rates than many other taxonomic groups worldwide. In the 50 years since passage of the US Wild and Scenic Rivers Act, wild and scenic rivers (WSRs) have contributed significantly to the conservation of native aquatic biodiversity as well as to the conservation and restoration of essential habitats. A changing climate and increasing societal demands on water resources make river conservation urgent. The US Wild and Scenic Rivers Act (WSRA) provides a flexible policy framework ready to protect the nation’s rivers. Dam removal is a major contribution to rewilding of rivers, through restoring riverine ecosystems; reconnecting upstream and downstream wilderness for fish, predators, and humans; and enhancing social-ecological resilience to climate change and other stressors. To date, economic valuation studies have focused on individual rivers and not the National Wild and Scenic Rivers System (NWSRS) as a whole. Following Morton (1999), we provide a brief conceptual taxonomy of on- and off-site economic benefits that might be relevant to the NWSRS. Fossil Creek was designated as a Wild and Scenic River in 2009. Its striking turquoise-blue waters support outstandingly remarkable values related to recreation, geology, biological resources, and Apache and Yavapai traditional and contemporary cultural values. However, until recently Fossil Creek was known not for its unique and significant river values but rather for its importance as a hydroelectric resource. The world’s first and most extensive system of protected rivers began with the United States’ passage of the Wild and Scenic Rivers Act in 1968. The 50th anniversary of that legislation in 2018 affords an opportunity to review the program’s legacy, which has grown 16-fold in mileage, and to consider its future, which continues to evolve with the changing currents of history. The Visitor Use Management (VUM) Framework affords managers the opportunity to describe and achieve specific outcomes – desired resource conditions and visitor experiences – and provide sustainable recreation on federally managed rivers. The need to manage visitor use has grown in importance as recreation on US federal waters has increased in recent decades. We are in the midst of a wave of 50th anniversaries. Specifically, the wave consists of 50th anniversaries for legislative milestones in the United because the 1960s were a time of profound social and environmental change. The Civil Rights Act, the Wilderness Act, and the Land and Water Conservation Fund Act were all enacted in 1964. To download: click the button above, and then click the download button on the newly opened tab.